This system is evolving to STM16 / OC48 and can work in SDH or SONET mode depending on the software selection and choice of tributary cards. This modular high density system can be configured with two aggregate rings STM1-4/OC3/12, up to 3 sub-rings STM1/OC12 SNCP/UPSR, or 6 STM1/OC12 MSP (1+1) or 1 STM4/OC12 MSP (1+1). Full cross-connect at VC11, VC12, VC3 to VC4 is provided. It is a true SDH/SONET HUB for the transport and distribution of PDH E1/T1/E3/DS3 links and Ethernet/Gigabit Ethernet LAN with QoS and high speed protection. 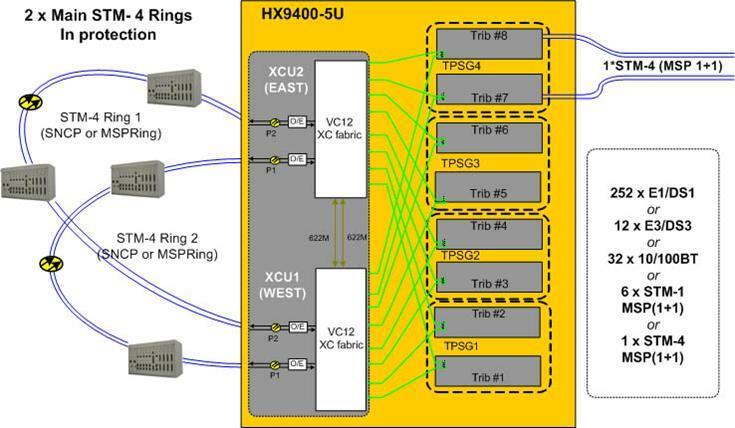 The HX9400R acting as a SDH Hub has a combined capacity (aggregates + tributaries) as a Terminal Multiplexer of 10 STM1/OC3 protected in MSP (1+1), or as an Add and Drop Multiplexer of 8 rings STM1/OC12 protected in SNCP/UPSR. 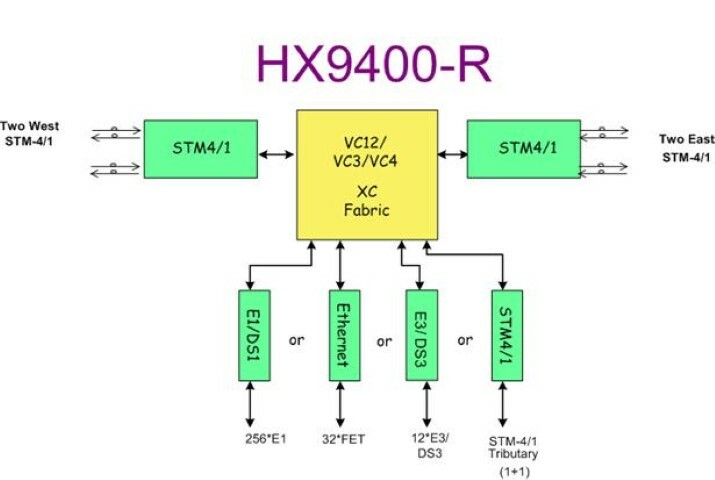 The HX9400R can be upgraded to an HX9416R by exchanging the CPU/Cross-connect/Aggregate card to provide a system with 2 STM16/OC48 rings of 2.4Gbps each. The HX9400R is deployed in Transport (Train/Metro/Airport) Energy (Oil/Gas/Electricity), Defense and Telco networks to distribute TDM interfaces and Ethernet or to concentrate TDM/PDH multiplexers with multiple analogue/voice/serial/video/SCADA tributaries. The HX9400-R, as with all of the CXR New Generation SDH/SONET HX9000 product family, is transporting the Ethernet/Gigabit Ethernet in EoS. 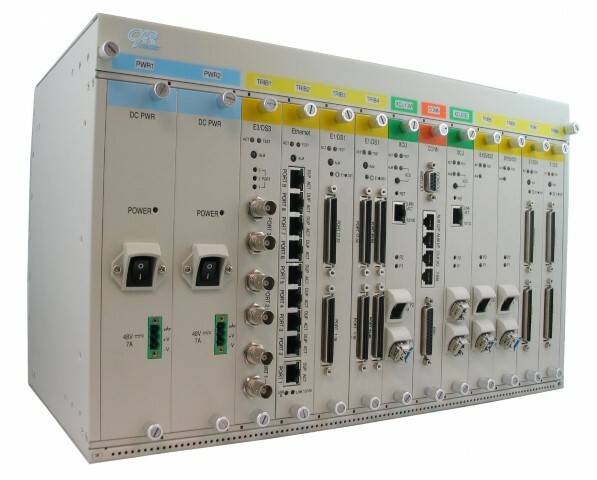 This equipment supports GFP and VCAT for the conditioning of Ethernet traffic and LCAS protocol to optimise the variation of the circuit bandwidth. The utilisation of NG SDH/SONET allows for the transport of Ethernet traffic with a high level of security and a permanent QoS. The layer 2 switch cards provide E-line or point to point transport of Ethernet, and E-LAN or multipoint LAN over the SDH/SONET pipe. Each Ethernet WAN circuit can use n VC12/VC11 (n 2.2Mbps) or n VC3 (n 47Mbps) or n VC4 (n 150Mbps) up to 4 VC4. The HX9400-R can be managed locally over a console port or LAN port as a craft interface with menu driven language or remotely over the DCC channel in the SDH/SONET fiber or in Ethernet In-Band or Out-Band with Telnet or SNMP. CXR provides two options for centralized administration: a basic NMS called CXRView-Plus and a more powerful and sophisticated solution (TMS) for larger system called CXR-iNMS.